Modularity — Modular I/O and communication interfaces provide a configurable and expandable system. A system should be configured for the required number of I/O and the communication networks. Later, when system expansion is necessary, I/O or communication interfaces can be added. Speed — Fast delivery of messages between networks, between links within networks, and between modules across the backplane. Toughness — Industrially-hardened hardware platform is designed to withstand the vibrations, thermal extremes, and electrical noise associated with harsh industrial environments. Broad I/O options — A large selection of 1771 I/O modules available for use in the local I/O chassis, and an even larger selection of I/O available at locations remote from the processor, can be connected across ControlNet™, DeviceNet™, and Remote I/O links. 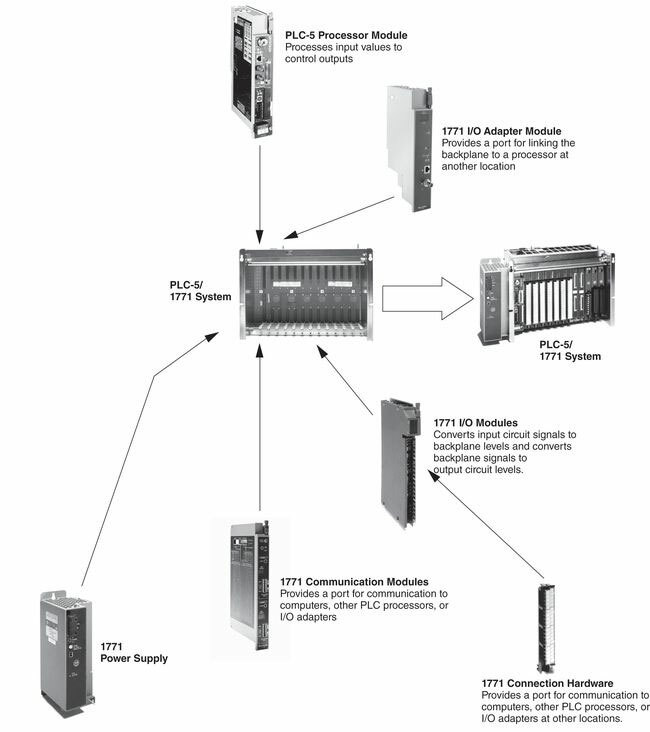 A PLC-5 processor communicates across the 1771 backplane to 1771 I/O modules in the chassis in which the processor resides. The different models of PLC-5 processors have various on-board ports for communication with other processors, computers, and remotely located I/O. Also, separate modules are available to provide additional communication ports. Each PLC-5 processor has a built-in RS-232/422/423 communication port. Each PLC-5 processor also has one or more on-board ports that can be configured for either Data Highway Plus (DH+) or Universal Remote I/O. As a Universal Remote I/O port, it can be configured as either an I/O scanner port or an I/O adapter port. Selected models of PLC-5 processors have on-board ports for Ethernet, ControlNet, or Extended Local I/O communication. In addition to the on-board ports available with PLC-5 processors, adding another communication port for a PLC-5 processor is as simple as adding an optional communication module. 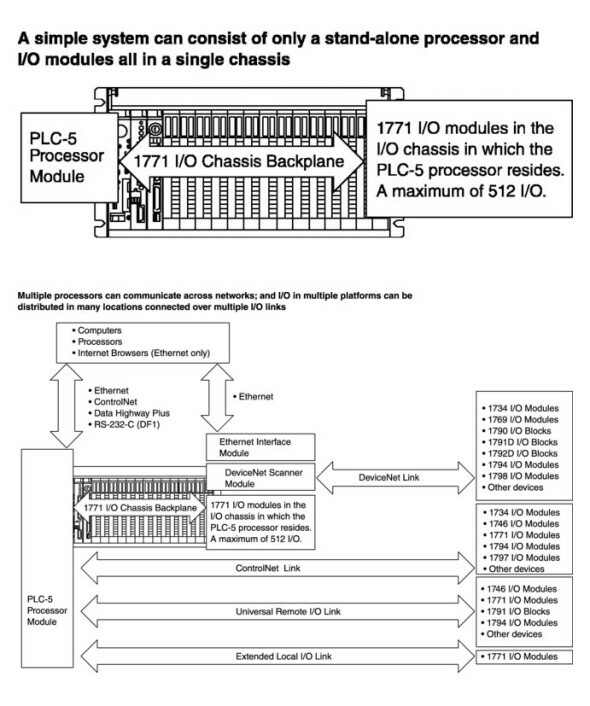 I/O adapter modules for 1771 I/O are available for ControlNet, Universal Remote I/O, and Extended Local I/O links. An I/O adapter module in a chassis with I/O modules interfaces the I/O modules with the I/O link for communication with a scanner port of a processor at another location. A PLC-5 / 1771 control system at minimum consists of a processor module and I/O modules in a single 1771 chassis with a power supply. Choose the processor module with the on-board communication ports needed. On-board Universal Remote I/O scanner ports are available on all PLC-5 processors. On-board Extended Local I/O scanner ports are available on some PLC-5 processors. On-board ControlNet ports are available on some PLC-5 processors. To provide a DeviceNet I/O scanner port to the system, a DeviceNet scanner module (1771-SDN) is necessary. In this typical configuration, a ControlNet port on the processor module interfaces the processor to the ControlNet link. In each of the two chassis remote from the processor, a 1771-ACN15 I/O adapter module provides I/O modules in those chassis with an interface to the ControlNet link. The PLC-5 processor monitors/controls the I/O in its local I/O chassis as well as the I/O in the remote locations. The 1771 power supply module plugs into an I/O module slot, or you can connect a stand-alone 1771 power supply to the left end of each chassis.